Assessed aspects of sustainability: Environmental and economic. Main purpose of the assessment: To enable life cycle system optimisation on environmental, technical and economic. Description of the methodology: This approach establishes a link between the economic and environmental performance of a system from ‘cradle to grave’ by combining multiobjective optimisation with LCA. 4. Multicriteria decision analysis and choice of the best compromise solution. 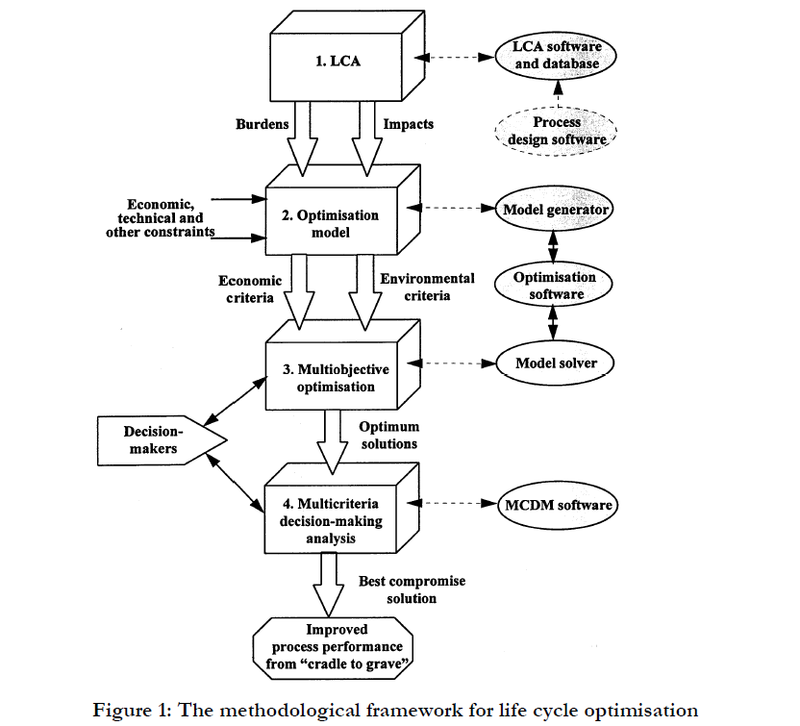 The diagramatic representation of the lifecycle optimisation approach is given in Figure 1. The first step in this procedure involves carrying out an LCA study of the system, by following the ISO 14040 methodology. As indicated in Figure 1, an appropriate LCA software can be used to carry out material and energy balances and to quantify the burdens and impacts along the life cycle. The material and energy balances for the process itself can also be carried out within an existing flowsheeting package and these data can then be fed into the LCA software. The data for the other parts of the system can be sourced from a database which is normally an integral part of the LCA software. The environmental burdens and impacts quantified in LCA represent an input into the optimisation model, which is formulated in the next step. The optimisation problem in the context of LCA is equivalent to a conventional optimisation model except that in addition to an economic function it also involves environmental objectives, represented by the burdens or impacts. Thus a single objective optimisation problem is transformed into a multi-objective one. The system is optimised simultaneously on both economic and environmental performance, subject to certain constraints encompassing all activities from cradle to grave. This results in an n-dimensional non-inferior or Pareto surface with a number of optimum solutions for system improvements. By definition, none of the objective functions on the Pareto surface can be improved without worsening the value of any other objective function. Therefore, some trade-offs between objective functions are necessary in order to reach the preferred optimum solution in a given situation. In step 3, the system is optimised on environmental and socio–economic objectives of interest to the decision-makers, to yield a number of optimum solutions. A suitable optimisation technique and software (such as XPRESS-MP and GAMS) are used to generate and solve the optimisation problem. The choice of environmental objectives for optimisation depends on the goal and scope of the study. Thus, optimisation can be performed either at the Inventory or Impact Assessment levels, in which case the environmental objectives are defined as either burdens or impacts, respectively. Ultimately, environmental and economic objectives could be aggregated into a single function by attaching weights to indicate their importance, so that the problem reduces to a single objective. 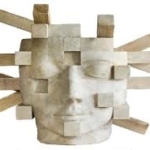 However, the main advantage of MO is that it does not require a priori articulation of preferences, so that the whole non-inferior set of solutions can be explored. The emphasis then is on the range of choices from the set of non-inferior solutions, rather than explicit definition of preferences before analysing all the trade-offs among objectives. The trade-offs show explicitly what can be gained and what lost by choosing each alternative. Finally, the last step enables the decision-makers to choose the best compromise alternative from a range of optimum solutions. One of the possible ways to choose the ‘best’ solution is to consider a graphical representation of the non-inferior set and then choose the best compromise solution on the basis of the trade-offs. However, this approach is limited to two or three objective functions at most, because graphical representation becomes less than helpful with more than three objectives. Other methods that allow ordering and quantifying of preferences, usually referred to as multicriteria decision-making (MCDM) techniques, can be used to identify the best compromise solution. The choice of a suitable MCDM technique will depend on a given decision-making situation and the sophistication of the decision-makers. Most of these techniques are based on a definition of a multiattribute or utility function, which associates a number with each alternative to reflect the importance of the attribute in the opinion of the decision-maker, so that all alternatives may be ordered. An approach similar to this was used by Kniel et al. (1996) for the optimisation of a nitric acid plant. Azapagic (1999) and Azapagic and Clift (1999 a & b) have illustrated this approach on a real mining and processing example for boron products. Hu et al., (2006) applied this approach on a case study of cassava-based fuel ethanol as an alternative automotive fuel in Guangxi, China. This approach provides a robust framework for life cycle optimisation on environmental, technical, economic and other criteria. By being able to show transparently and trade-off incommensurable objectives, e.g. environmental impacts and economic costs, this approach avoids the well-known problems encountered, for instance, in cost–benefit analysis, i.e. reducing individual preferences to a market value or trying to express the quality of the environment in financial terms. By optimising on the whole life cycle of the system, this method provides a more effective approach to environmental management. The advantage of using multiobjective optimisation in the context of LCA lies in offering a set of alternative options for system improvements rather than a single optimum solution, and so enables the choice of the Best Practicable Environmental Option (BPEO) and Best Available Technique Not Entailing Excessive Cost (BATNEEC). This approach provides a potentially powerful decision making tool which may help to identify options which are both environmentally and economically sustainable. The methodology is quite complex and requires know-how in both systems optimisation and LCA. In addition to conventional LCA requirements, this approach requires data on process and socio-economic aspects, which means more time and resources are needed to carryout the analysis. In non-linear systems, it is difficult to find global optimum as local optima can be confused with the global ones (this is a perennial problem in non-linear optimisation). Interpretation of results can be difficult, due to numerous criteria that are considered simultaneously. LCA coupled with multi-objective optimisation techniques provides a powerful tool for system design and optimisation. Multi-objective optimisation serves to identify a number of Pareto-optimum options for improved design and operation throughout the whole life cycle. It offers a potential for technological innovation through selection of best material, energy and process alternatives over the whole life cycle. This can be of particular importance if placed within the context of EMAS and ISO 14000 EMS, as well as the IPPC Directive, which require companies to have a full knowledge of the environmental consequences of their actions, both on- and off-site. Although the evaluation of trade-offs among the objectives to choose the best compromise solution will still imply certain preferences and value judgments, at least the choice will be made from all possible non-inferior solutions, unlike other methods where the bulk of non-inferior solutions may be ignored. This is particularly relevant in the LCA context, because it enables avoiding the controversial and debatable concept of aggregation of environmental impacts into a single environmental impact function in the Valuation stage. Where there are multiple decision makers with conflicting interests, this technique can help to resolve disputes by generating different alternative solutions. Like other broadening and deepening approaches, trying to squeeze too much into LCA, may put end-users off as LCA is complex and complicated enough. 7. This section is largely based on Azapagic (1999) and Azapagic and Clift (1999a &b). Azapagic, A. (1999) Life cycle assessment and its application to process selection, design and optimisation, Chemical Engineering Journal, 73: 1–21. Azapagic, A. and Clift, R. (1999a) Life-cycle assessment and multi-objective optimization, Journal of Cleaner Production, 7(2): 135–43. Azapagic, A. and Clift, R. (1999b) The application of life cycle assessment to process optimisation, Computers & Chemical Engineering, 23: 1509–1526. Hu, Z., Tan, P. and Pu, G. (2006) Multi-objective optimization of cassava-based fuel ethanol used as an alternative automotive fuel in Guangxi, China, Applied Energy, 83(8): 819-840. Kniel, G., Delmarco, K., and Petrie, J. (1996) Life cycle assessment applied to process design: Environmental and economic analysis and optimisation of a nitric acid plant. Environmental Progress, 15 (4): 221–228.